You can’t forget those rows of headstones every mile or so. 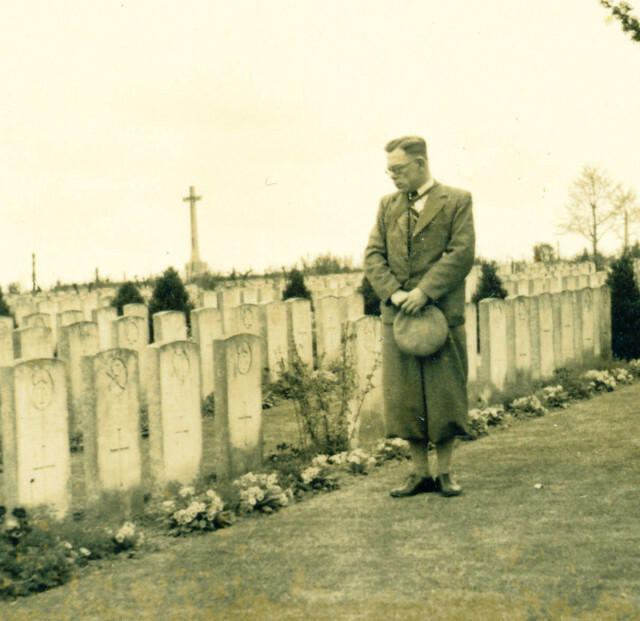 This photograph from the 1930s shows one such veteran, at New Irish Farm Cemetery, close to Ypres. He looks down on a row of graves of two Royal Welch Fusiliers, a Machine-Gunner and an Irish Rifleman. Which one was the grave he had come to see? Was it a family member or a comrade he had left behind on the battlefield? We will never know, but it was clearly a defining moment for him, and one he wanted to recall by having the visit photographed. This is not a tourist snap; it is an insight into loss, regret and no doubt a little guilt, at having survived when this man did not. What was passing through his mind as he looked down on the white stone? The beauty of a simple image that poses more questions than it answers. This entry was posted on 11/02/2012 by sommecourt. It was filed under Battlefields, Belgium, Flanders, Great War, Veterans, War Cemetery, WW1, Ypres and was tagged with Battlefields, Flanders, Pilgrimage, Veteran, War Cemetery. I love the attached poem and riveting photo. Not sure if I want to go back to Iraq. I just feel no need to immerse myself back into that place. There are good people, beautiful places and endless history to see but I am just not ready…. I must say your site has a great theme. There’s definately a great deal to learn about this issue. I like all the points you have made.